I bought these to replace a pair of 12 month old Richa boots that started wearing on the top from changing gear. I commute all year round and wanted a pair of boots that were warm and completely waterproof. This was put to the test during a heavy downpour on the motorway. I can confirm that they are totally waterproof and have been warm enough during my 2 degree commutes. My only criticism is the soles, when wet, have zero grip on my foot pegs. I've found this to be quite disconcerting the first time when my foot slipped off the peg when going round a roundabout. This must be an Alpinestars thing because my SMX-5 boots are exactly the same when the soles are wet. This aside I wouldn't let this put you off. These are comfortable, high quality and great value for a pair of Gore-Tex boots. This is the Second pair of these boots I have , have the first pair about four/five years and ware them daily, still waterproof and very comfortable but getting tatty. Great price had to have them. Great quick delivery with SBS as usual, couldn't pass them for value and service. I bought these to replace my TCX Explorer boots which started leaking after a solid 3 years/winters use. The A* boots feel well made and designed. Not the best looking boot, but no touring boot will be. I like that the Velcro flap on the side covers the entire zip. My TCX boots only had a 2" flap which covered the top of the zip, the exposed zip area was where the leak started so I think the A* are a step in the right direction to prevent that type of leak from happening again. The A* boots are comfortable and I could happily potter around in them all day, maybe not go hiking in them but would be fine for touring and a bit of walking in between stops etc. I got these at the beginning of March as I realised my TCX weren't going to cut it anymore, they have been through some lairy rainy and wet rides since and have done their job - dry feet. I am confident that they would stand up to the heaviest monsoons. As these are marketed as an all year round touring boot, they have to strike a fine balance between being insulated and not too warm in the summer. Having used these in temperatures as low as -4, these are not the warmest boots. Below 6-8 degrees C and my toes feel cold. I have bought these in my normal shoe size and have no problems with the fit, I wear normal socks with them. I would happily recommend these to anyone after a Goretex touring boot. I'm hoping I'll get at least 3 years use out of them. The sole is also noticeably thicker than my previous boots and as such, there was a bit of an adjustment period when I first started using them as there was less feel for the brake pedal. Really good quality, comfortable to walk in, feels like a shoe, great in the rain as well as tested in the lovely British weather. These boots are the top star in my opinion, these far out strip any boots I've had before. The fit the feel and the material is unbelievable & excellent value for the money. 100% would recommend to all my fellow bikers. I had the previous model of these boots for over ten years before any water started to leak in even in heavy rain. Got a new pair when the old ones were finally at the end of their journey. Compared to the old ones, the boot is a bit tighter fit especially around the toes, but otherwise an excellent pair. Bought as a short pair option and they fit will due to the under calves fitting. Not used in the rain, so hoping they match the claim of fully waterproof. These boots were quite stiff to begin with which is to be expected, but softened up with wearing about the house for a few hour so no problem. Not been used in the rain so unable to rate how waterproof they are. The reason I have given them a 4 star rating and this may be a bit harsh considering there had been quite a severe frost the night before in February in Scotland, but with 2 pairs of socks on my feet were still cold. Still very early to give a proper review but happy with the purchase so far. Bought these for my pillion for an upcoming European tour. Bought her usual size 41 but had to return for a size 42. Return service was no trouble at all. The left side is totally different feel from the right. It is painful to walk in it while the other side is perfect. It is also giving me a muscle ache just to keep my foot above the brake when needed. I am waiting for it to loosen a little, but after 2 weeks it is still painful, probably a bad pair but I do not have the box so I'll keep it and remind myself not to throw the box so soon. Gore tex is the best so I am not surprised it keeps me dry. Excellent quality boots. Comfortable from the first time I wore them. Haven't worn them in the rain yet but have no reason to think they won't do the job. Excellent service by Sportsbikeshop. Arrived within two days of ordering and before the given delivery date. Excellent quality,sure they will last years.im a size 8 and size 43 was a great fit. Awesome boots, fully waterproof gore-tex. Zips and velcro of high quality and very comfortable. Fast delivery and quality service from SBS. I bought a pair of these at the end of July 2018. I had to return them after a week or so because one of the zips broke. As usual, Sportsbikeshop were excellent at arranging a replacement pair, which have been absolutely fine since. After getting caught in some very heavy rain and hail the other day, I can now leave a full review. I have had a few pairs of boots that have been advertised as waterproof, but only seem to be okay in light rain. That is not the case with these thanks to the Gore-tex which is usually a feature in more expensive products. I've been in some real heavy rain with these, and my feet have been bone dry. They feel well made, are very comfortable and have good ankle, heel and shin protection. 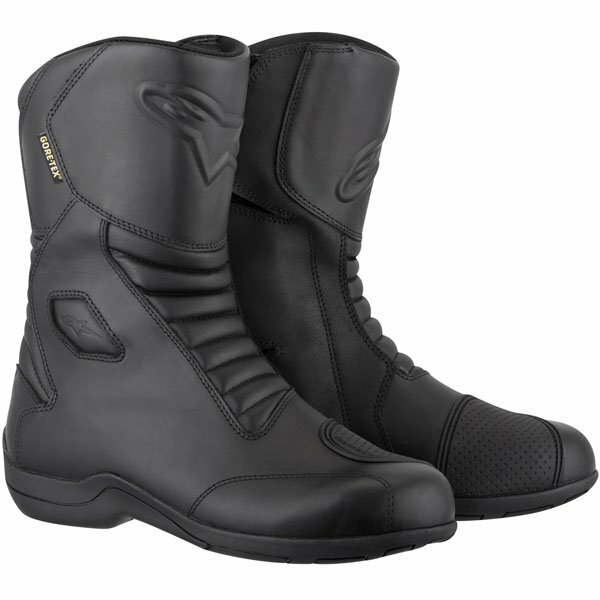 I would highly recommend these, for a big brand like Alpinestars and Gore-tex, the price is good for under £200. I tried a few Alpinestars boots but these seem to have the best protection. I've worn them when it's been hot and now as the weather is changing, they are still the same, nice and snug. Not too hot or cold. Still haven't worn them in the rain but word on the street is they're as dry as. I'm a size 9 and they are a snug fit with a standard sock. They will loosen up through wear, ready for a thicker sock in the winter months. Top quality solid boots. Highly recommend. Riding 400+ miles per week every week of the year I was looking for boots comfortable, warm and waterproof. Recent +3 degree temperatures in the morning prove the first two and I have no doubt of the latter with GoreTex. Hopefully they will last longer than 2 years which is all my previous paid (IXS) managed before cracking and falling apart. First pair pretty worn now so treated self to a new pair - great spec, great fit - size 43 in these fits me great - can't say same for the Sidi's I bought and had to sell - these great value for spec. Great for on and off the bike. As much as I enjoy these boots, the right feels completely different from the left. The left is perfect however the right feels not only tighter in the width but also as if the arch is different. Normally I find my left shoe to be tighter due to my left foot being the slightly bigger of the two. Apart from this they are great. It could perhaps just have been a slight factory defect. It wouldn't deter me from buying them again. Bought these to replace Sidi black rain that I had for years but were very comfy. These seem on a par for comfort, sizing like for like and are ok for walking about in. Not been out in rain as yet so cannot comment on waterproofing but other than that all good.